Automotive engineers from all over the world gathered in Windsor for the University of Windsor’s International Crashworthiness Symposium on Monday. The engineers discussed the design of lightweight vehicles and innovations that improve fuel efficiency and vehicle safety. 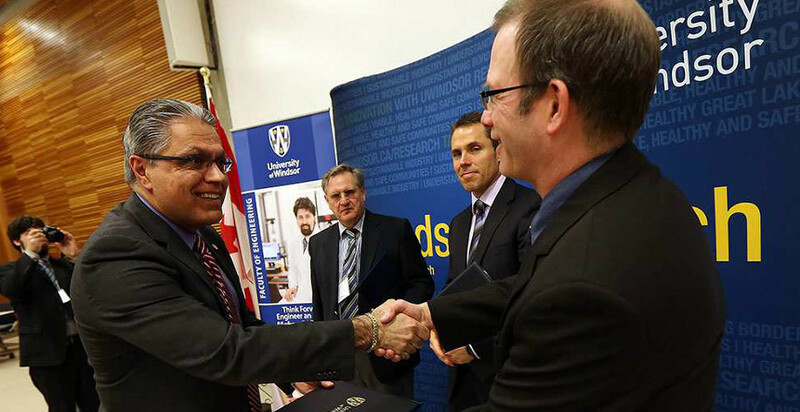 The U of W has also recently entered into the Co-operation Agreement on Novel Lightweight Technologies for Improved Crash Safety along with the University of Waterloo and the German Aerospace Centre. The new partnership will allow Canadian academics and German industry experts to work together to find new ways of using lightweight materials for crash safety. “The focus of the agreement is about collaborating and developing novel ways to dissipate energy in a crash, for the protection of people within vehicles,” said Dr. Bill Altenhof, professor of mechanical, automotive and materials engineering at the U of W and an organizer of the symposium. The participants finished with a gathering sponsored by the National Research Council of Canada in the lobby of the Centre for Engineering Excellence. “When you are in a severe accident, your life, and many of those close to you, will change forever,” said Altenhof.